The jacket is from PoF 1, but I have changed the front from a stomacher closing to a closed front with hooks and eyes, like a caraco. I think that with that alteration this jacket will be dated somewhere between 1770-1780, which means that I can wear it with both hoops and bumroll. 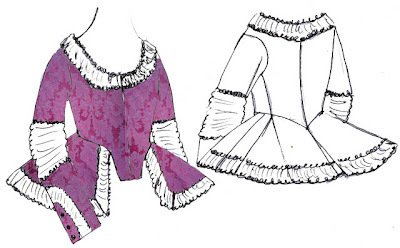 The trims will be made of a gathered strip of striped cotton voile with a gathered ribbon stitched on top on both sides. I have not decided yet what color the ribbon will be, maybe a dusty green? Or a matching pink? I think green would be nice!